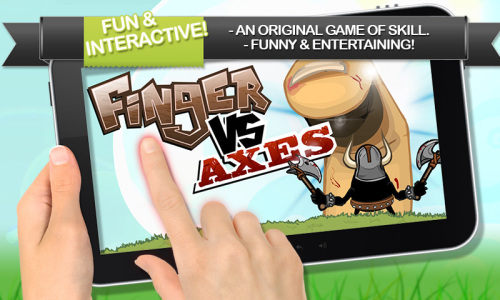 Description Finger VS Axes is a funny action game where you are the big boss. Use your finger to taunt the enemy. Swipe to evade & avoid its attacks. Bash and smash it on rocks when it's time! A fun arcade game featuring awesome weapon upgrades like a ball & chain, a machine gun turret, and a resistance shield. Play in multiple worlds and levels, with a progression difficulty. A small, fun and original game made to be interactive and entertaining. Enjoy! Controls Keep mouse pressed at all times. Try to avoid the enemy's attacks and swipe down to bash him.